‘Death Note’ was awarded the top prize in the Musical category at the ‘3rd eDaily Culture Awards’ award ceremony and Gala Concert, held at the Haeorum Theater of the National Theater in Jangchung-dong, Jung-gu, Seoul on the 19th. 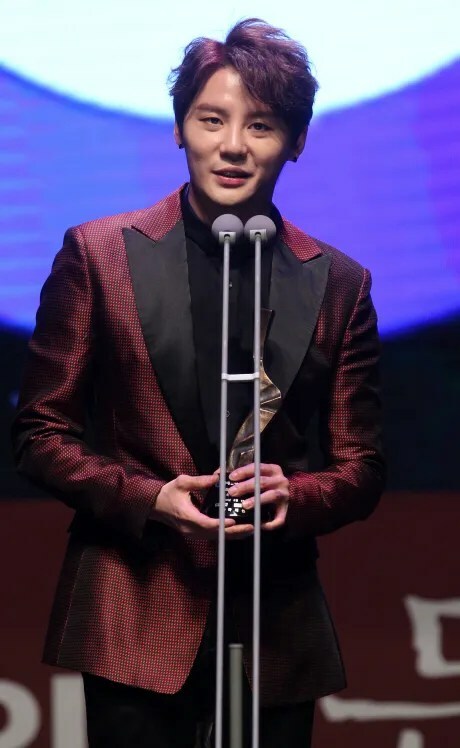 Embarking as the top prize winner’s representative, group JYJ member and musical actor Kim Junsu stated his thoughts, like this, “I am accepting this award with praise and encouragement. I promise that I shall go forward in creating a better work in the future ahead”. Kim Junsu received favorable reviews, reborn as a convincing character when he undertook the role of the genius detective L in ‘Death Note’. The ‘3rd eDaily Culture Awards’ judging committee had given [the musical] a generous score, in regards to the points that it recreated the original Japanese work into a version for just Korea, took part in the diversity of a domestic musical –i.e., a one-cast of its cast of characters and 7 performances per week–, and corresponded to all judging standards –i,e., its cinematic quality and commercial success–. Its stage and musical numbers covered by the Korean actors’ prominent singing abilities and actings increased their strengths in the work, despite not making changes with the Japanese version. fantastic junsu! sure wish i could have witnessed it! Congrats to JS I am so happy for him!!!!!!! I’m so proud of you Dear Mr. Songman!